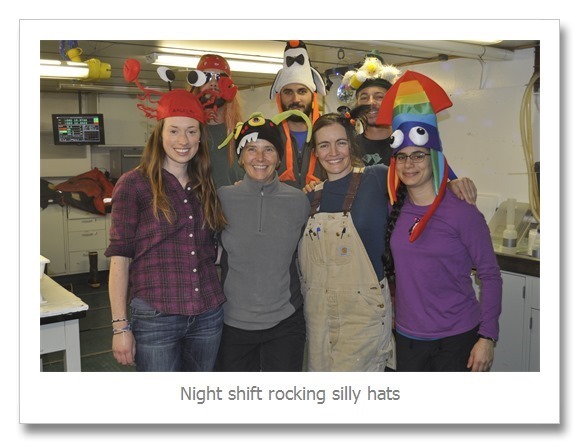 Apparently, when I published this blog from the ship, none of the photos made it! For Shame! So here it comes again. We have a cruise tradition of celebrating the halfway point of the cruise. We call that day “Hump Day” and Tony, chief of morale, plans fun activities. As luck would have it, we had a 6 hour transit that night as we switched survey lines. That gave us 6 hours to party! Whoop Whoop! When we got hired onto the cruise, Tony told us that we would have a silly hat/ wig party on hump day. Night shift brought their A-game. Angela was feeling “crabby”, Tony was rocking out Axel Rose style, R2D2 (that would be the second Ryan D), was a proper penguin, Kim D was feeling monstrous, Shaun had chicken and beer on his mind, Kim B was a prim little which, and I was an enormous rainbow squid. 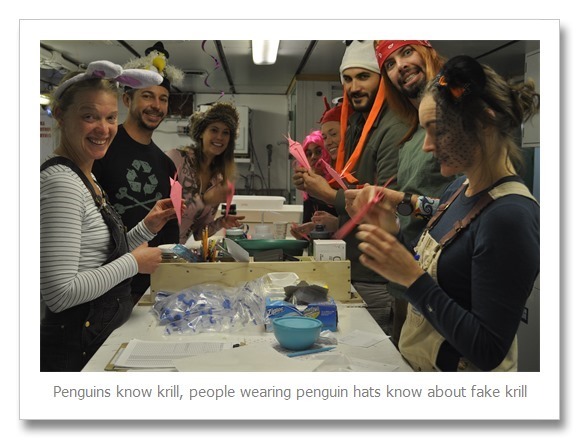 Keep in mind, we all brought these hats with us to Antarctica. They got some precious real estate in our luggage. There was fun. There was music. There was a very serious blind gummy bear taste test. I sadly do not have pictures of this because I ran it. Tony and I each brought 10 pounds of Haribo Gold gummy bears to share on the cruise. They were a HUGE hit. We have been trying to ration them so that they don’t disappear too fast. The day before hump day our ration for the week ran out. The new week started on hump day and the bears came back! To celebrate, we did the 7 bear taste test challenge. We each had 7 bears, one of each of the five colors and two random bears. We did not know which 7 bears we had. One by one we tasted the bears and guessed the flavor. Tony was the reigning champ with 4 correct guesses. I only got two. That test was hard! After gummy bears R2 taught us how to make origami krill. 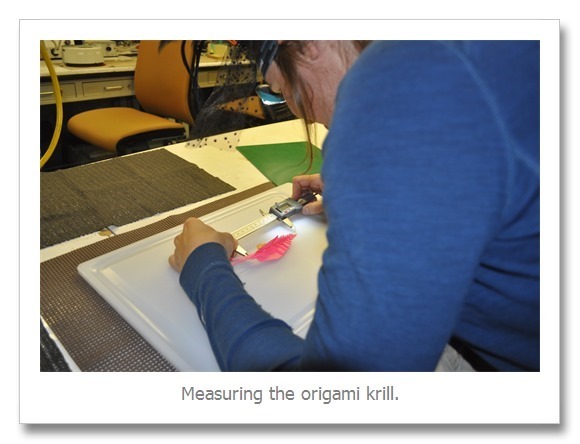 We got very excited about origami krill. See that blue bowl? That is where the gummy bears live. It is a sad sad day when it is empty. 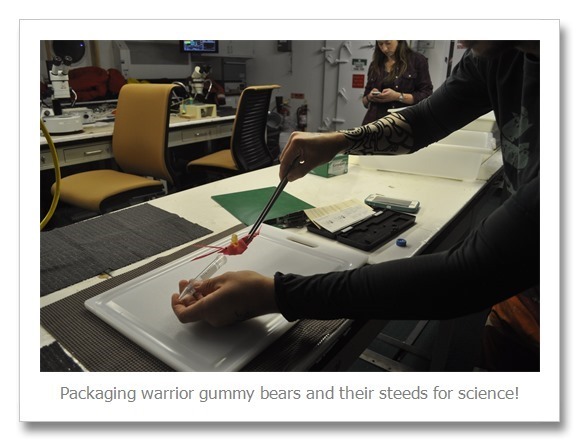 We got so excited, we made a krill cavalry complete with mounted gummy bear warriors. 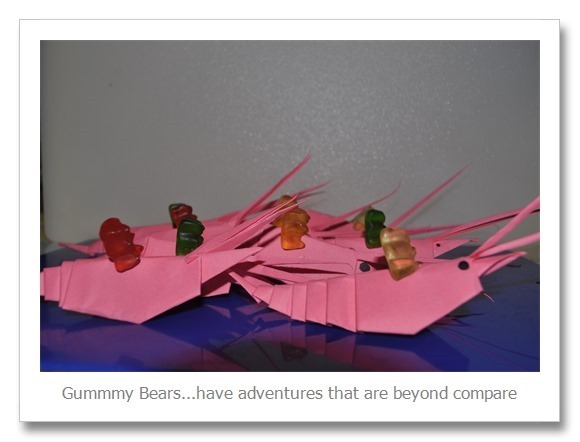 We might have been singing along to the gummy bear theme song while we built our army. 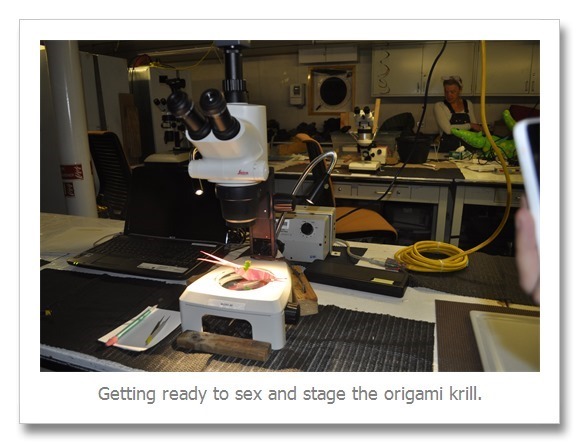 Of course after we made our army, we had “krill” in the lab. We were then obliged to do what we do best. Gah! 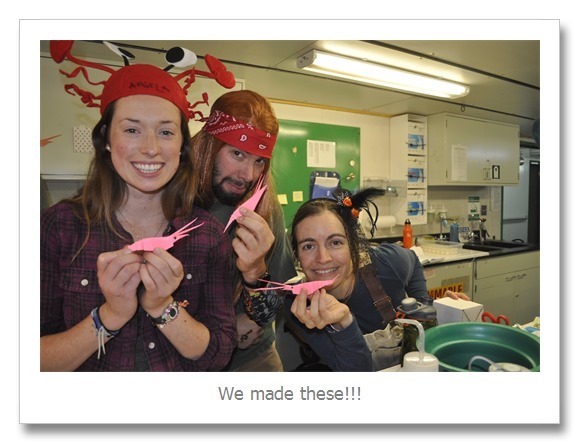 We are such zooplankton nerds! Even when we have a party, we bring krill along for the fun. After all that excitement, we played animal charades until it was time to set the net. You try miming a string ray and see how that goes for you. It was a great , and super nerdy party! Now back to work for me!